PHUKET: The tidal wave that hit Phuket this morning has claimed the lives of 35 people and injured some 355, Wisut Romin, Deputy Secretary of the Phuket Provincial Administration Office, has announced. Speaking at the emergency rescue headquarters set up at the Phuket Provincial Office, K. Wisut said that an earlier report had recorded 11 dead at Kata Beach, and nine more at Nai Yang where some 91 people were injured and unknown number had disappeared. K. Wisut added that three people died at Patong, two at Nai Harn, another two at Rassada Port in Phuket City, and two more at Kamala where about 150 people were injured. Government officers and police are currently working to evacuate coastal areas in anticipation of another, aftershock wave. A warning has been issued on local radio stations for people to stay away from the beaches, particularly those at Patong, Kata, Karon, Rawai and Kamala. 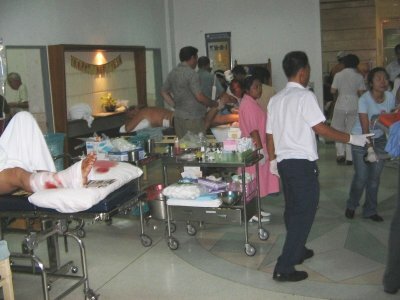 Phuket Governor Udomsak Usawarangkura has also ordered doctors with private clinics to remain on duty to treat any person injured, this to alleviate the load on the island’s hospitals, which have been inundated with injured since the wave hit.